Of over a dozen mills on the Dour, five were paper mills. 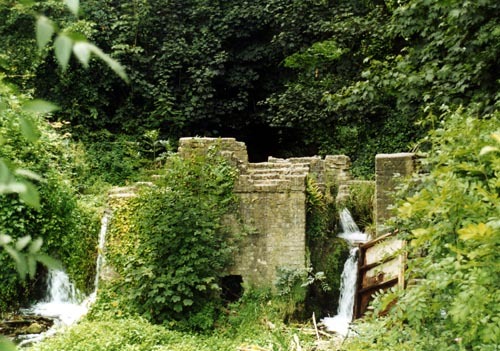 The clean spring waters of the river offered both a power source for breaking up the paper pulp and a ready supply of suitable water for the wet phases of manufacture. Bushy Ruff Paper Mill was built in 1794 to manufacture brown paper. Its owner William Knocker built a fine house, Bushy Ruff House, which stands above and West of Russell Gardens. The house was caught fire in recent years and is now derelict. A white paper mill was added in 1794 with a new mill pond, still enjoyed by the public as part of Bushy Ruff park. The new mill had a more efficient overshot waterwheel. The mill must have gone into decline, for an insurance assessor in 1815 described it a a miserable place. In 1823 it was leased out to Cooper, Packham and Company, and again in 1826 to George Dickinson who was made bankrupt, so little profit was made from the enterprise. William Knocker died in 1847 and the mill very soon closed, being demolished in 1870. The Stables and drying room still stand today and are now a house. Originally built as a corn mill, River Mill was sold to John Smith in 1689 as a "recently converted mill". The mill had many owners who had mixed fortunes - in 1756 it was sold to Thomas Radford. His journeyman (trainee), Willaim Phipps married Radford's daughter and bought the mill in 1780. By 1792 he was bankrupt, but recovered to build Crabble Paper Mill and re-lease River Mill. He bought the mill again in 1800. When William died in 1820. River Paper Mill paseed to his son, Christopher, who installed new papermaking machinery - the work would have previously been done by hand. The mill passed to Christopher's nephew Filmer, when Christopher died in 1867 and he was also made bankrupt, but was able to lease the mill back from the bank. It was sold in 1908 and finally closed in 1918. Its chimney remained standing until 1928, but now all that is left are ruins - strong brick structures through and over which the waters of the Dour make waterfalls at the far extent of Kearney Abbey park. In contrast to River Mill, Crabble Paper Mill was purpose-built by William Phipps. The mill's foundation stone gives a date of 1788 but it was described as "lately errected" in 1792, so there may have been a phased construction. In 1802 the second paper making machine in Britain was installed at the mill, and John and Christoper Phipps patented a Dandy Roll for making watermarks. The mill closed in 1894 and was sold to Wiggins Teape who used it as a rag room and for rag boiling. The mill burnt down in 1906 but was rebuilt for rag sorting and storage. After being shelled in 1944, it was rebuilt as a store only. The building was closed in 1989 and, in 2002, was converted into apartments. The most important of the Dour's paper mills was Buckland Paper Mill. Corn mills are known to have been on this site since the earliest of times, but the earliest reference to a paper mill is in 1638. In the early 1700s it was owned by Thomas Ingram, who passed it to his sons Thomas and Ingram. Thomas built Buckland House in 1820, today the only part of the mill still standing in tact. The mill burnt down in 1814, but was rebuilt and put up for sale on the retirement of Thomas Horne. No buyer could be found and it was again offered for sale in 1820. In 1822 it was leased to George Dickinson. He installed steam engines and two paper making machines. Dickinson was over-ambitious, seeking quick expansion of his business, leasing and building other mills and was bankrupt by 1838. The mill was again offered for lease but there was no interest until 1846, when it was leased for just three years to a Mr Weatherley before being sold to Charles Ashdown, who ran the mill in parnership with Henry Hobday, manager of Snodland Mill. A fire in 1887 provided the opportunity to remodel the mill which increased its production from two to twelve tons of paper a week. An important contract from London company Wiggins Teape was won to produce Conqueror paper, and in 1890 Wiggins Teape bought the mill to ensure a consistent supply of the paper. Henry Hobday became the manager. Buckland Mill was hugely improved in the 1920s, doubling in size. Buckland Paper Mill become a major employer in the town. The conqueror brand of paper manufactured at the mill had a world-wide reputation for quality and is still made at another site today but, in 2000, in a bid to make company-wide economies, Buckland Paper Mill was closed. In 2011 Dover Arts Directive undertook a project to collect personal memories of life at the papermill and produced an award-winning film - "Watermark". A very thorough history of the mill is given at bucklandmill.co.uk with many archive photographs. Today the site is undergoing redevelopment with the historic fascia of the mill wall with its clock tower and Buckland House preserved. The rest of the site is designated for mainly residential development. The site of the current Charlton Shopping Centre was once Charlton Paper Mill. George Dickinson built the mill in 1832, presumably to add to the capacity of Buckland Mill, which he was leasing. He built a very grand House, Brook House (This house should not be confused with the earlier Brook House built by William Moxton off Maison Dieu Road). Dickinson was a terrible businessman and was bankrupt by 1838 upon which he was banished by his brother, John of Croxley for his terrible errors of judgement in leasing Bushy Ruff and building Charlton Mill. Brook House was acquired for the Royal Victoria Hospital. It still stands just off Dover High Street and is now converted to sheltered accommodation apartments. Whilst in the possession of Minet and Fector's bank the mill was leased to several tenants then bought by William Crundall Senior for use as saw mills. It continued to be a timber yard until the 1960s.